Keep parts, tools, supplies and packages right at the assembly line or work center. Heavy-duty all-steel construction. Base is 1-1/2" x 1/8" angle iron with 11 ga. steel formed upright channels punched on 3-1/2" centers. 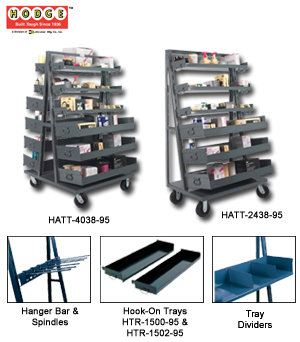 Hook-on trays are made of 16 ga. steel and must be ordered separately. Wire drop handles are supplied on all hook-on trays. Easy rolling on bolt on 6" x 2" phenolic casters, 2 rigid, 2 swivel. Finished in durable Gray powder coat finish. Shipped fully assembled and ready for use. FOB Shipping Point. Product No. Cap (lbs.) Description Size W x D x H Tray Cap. Wt. (lbs.) Price Ea. Product No. Description Size W x D x H Tray Cap. Wt. (lbs.) Price Ea. Product No. Fits Trays Wt. (lbs.) Price Ea.